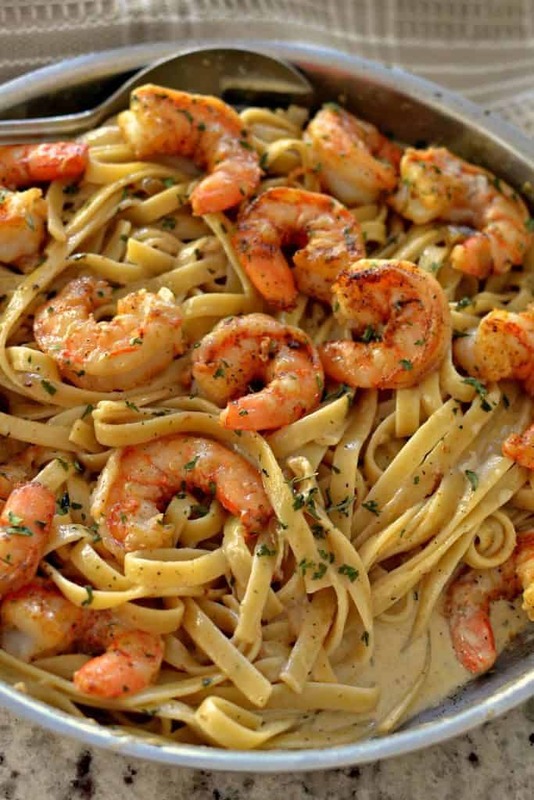 Cajun Shrimp Pasta is fettuccine and fresh shrimp in a delectable creamy creole seasoned sauce. This mouthwatering dish is easy enough for a weeknight meal yet elegant enough for company. My daughter and I are huge shrimp fans and this is one of our favorite dishes. When I walked into our local grocery store and saw jumbo gulf shrimp on sale I knew exactly what I was going to cook. This Cajun Shrimp Pasta is easy enough for even the novice cook. It is absolutely scrumptious and you can adjust the creole seasoning to your liking. Serve with a simple tossed garden salad and a glass of sauvignon blanc to complete this amazing meal. Arrange a clean area to work near the kitchen sink. You will need cold running water. If the heads are still attached to the shrimp find the first hinge in the shell behind the eyes and cut there to remove the heads. Most groceries and markets remove the heads prior to sale. To shell the shrimp pull on the legs and the shell will begin to peel away. You can remove the tail or keep the tails on for dishes like shrimp cocktail. Now take a small pairing knife and make a shallow cut down the center of the back to the top edge of the tail area. To remove the black intestine run the cool water over the back of the shrimp and rub so the vein will come out easily. Dry the shrimp with paper towels and refrigerate until ready to cook. 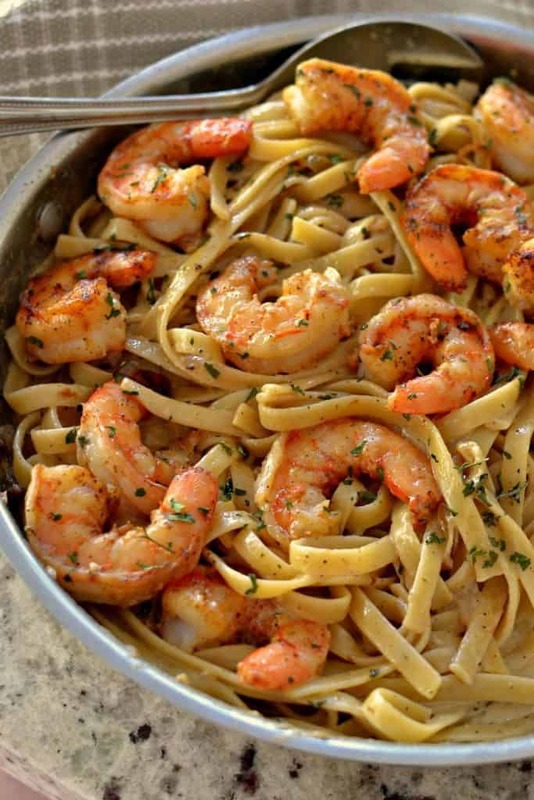 How to make Cajun Shrimp Pasta. First cook the fettuccine according to package instructions and drain well. Meanwhile prep the shrimp by peeling, removing the tails, and deveining. Dry the shrimp well and sprinkle with creole seasoning. Now in a large skillet melt some butter over medium high heat. Add shallots and cook for five minutes, then add your shrimp and cook for two to three minutes flipping halfway through. Add the garlic to the skillet with the shrimp in the last thirty seconds of cooking and stir constantly. Do not crowd the pan with the shrimp. If necessary plate the shallots, shrimp and garlic then add a little butter to the skillet and cook the remaining shrimp. Remove the shrimp, shallots and garlic to a plate, add the chicken broth to the skillet and cook to reduce by half. Scrape the bottom of the skillet to remove any brown bits. Reduce heat to low, add the cream and cook to reduce by half. Stir the sauce often and whisk in the Parmesan cheese when optimum thickness has almost been obtained. Season to taste with more creole seasoning. Add the shrimp and shallot mixture back to the pan with the sauce. Finally add the cooked fettuccine noodles back to the pan and toss to coat. Top with a sprinkle of fresh or dried parsley. Shrimp cook incredibly fast. If overcooked they turn rubbery, are not near as good, and maybe just barely tolerable. When shrimp are done they turn light pink on the outside and are no longer translucent but more white. Another way to identify when shrimp are cooked through is they curl into a ‘C” shape but you don’t want that “C” too tight. The head and the tail should not be touching. You have to be ready to go and remove them from the pan as quickly as possible. If you have never cooked shrimp before purchase a little more than the recipe calls for and do a test run with just a few in some butter over medium high heat. Stay right there with the shrimp. It moves very fast. 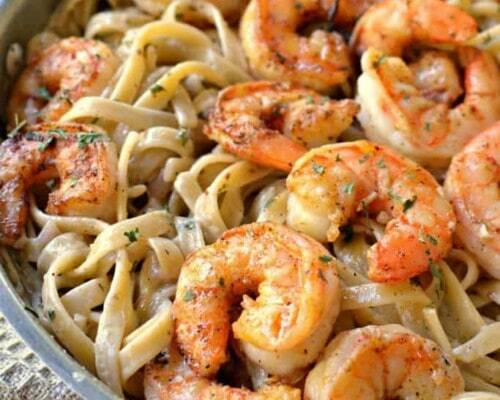 Cajun Shrimp Pasta is my idea of a perfect meal. Absolutely delicious, quick, dependable and easy. Put this on your too try list and let me know if you it enjoy as much as we do! 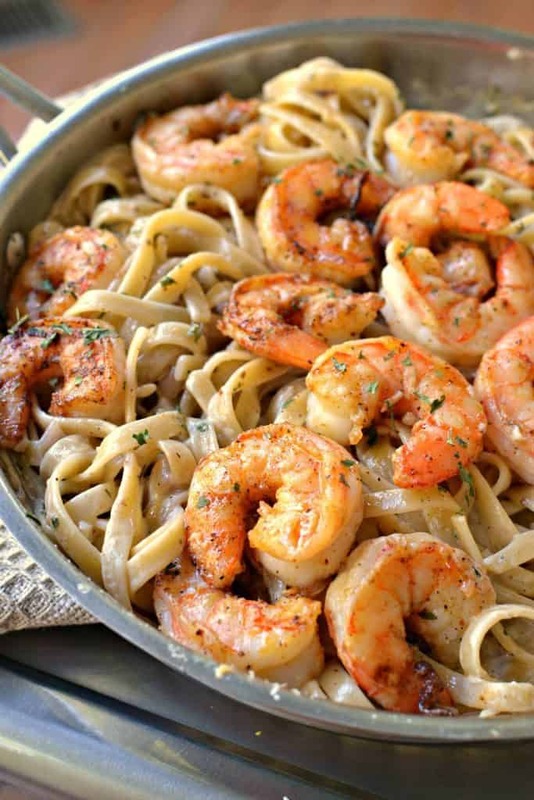 Cajun Shrimp Pasta is fettuccine and fresh shrimp in a delectable creamy creole seasoned sauce. It is easy enough for even the novice cook. Pat shrimp dry with paper towels and sprinkle them with 1 1/2 tablespoons creole seasoning turning halfway through. In a large skillet melt butter over medium high heat. Add shallots and cook for 5 minutes. Add shrimp and cook for 2-3 minutes flipping halfway through. Add the garlic to the skillet with the shrimp in the last 30 seconds of cooking and stir constantly. Do not crowd the pan with shrimp. If necessary plate the shallots, shrimp and garlic then add a little butter to the skillet and cook the remaining shrimp. Remove mixture to a plate and set aside. Add the chicken broth to the skillet and cook to reduce by half while scraping the bottom of the skillet to remove any brown bits. Reduce heat to low, add the cream and cook to reduce by half; stirring often. Slowly whisk in Parmesan cheese. Season to taste with creole seasoning. Add the shrimp and shallot mixture back to the pan with the sauce. Add the cooked fettuccine noodles back to the pan and toss to coat. Top with a sprinkle of chopped parsley. This looks so perfect! I love Cajun flavors so this is right up my alley! This looks so tasty and your directions make it so easy to make, even if you have never cooked with shrimp before! Great post! Great recipe and great tips for dealing with fresh shrimp for any recipe! Mmm, I love everything about this pasta. I like spicy food and expecially love shrimp. Can’t wait to give this recipe a try. Oh, I can almost taste this just from the photo – it looks so good! This is definitely one I will be making very soon!